例如iis下项目 使用www.iisproject.com访问, 则tomcat下的项目只能 www.iisproject.com/tomcatproject 这么访问, 如此变得不友好了. 我的实现方式, 利用IIS的应用程序请求路由 ARR (application request route) 来实现请求转发. 大致步骤( ARR使用请参考上篇文章或自行百度), 在iis上安装ARR, 配置2个server farm (iis应用使用一个iisFarm,tomcat使用一个tomcatFarm), 每个server farm中只有一台机器即localhost,端口使用自己应用端口(如上图iis 应用使用8080,tomcat应用使用8090) , 每一个server farm 都设置url重写routing rules规则, 规则中根据访问url的不同转发给不同的serverFarm处理. 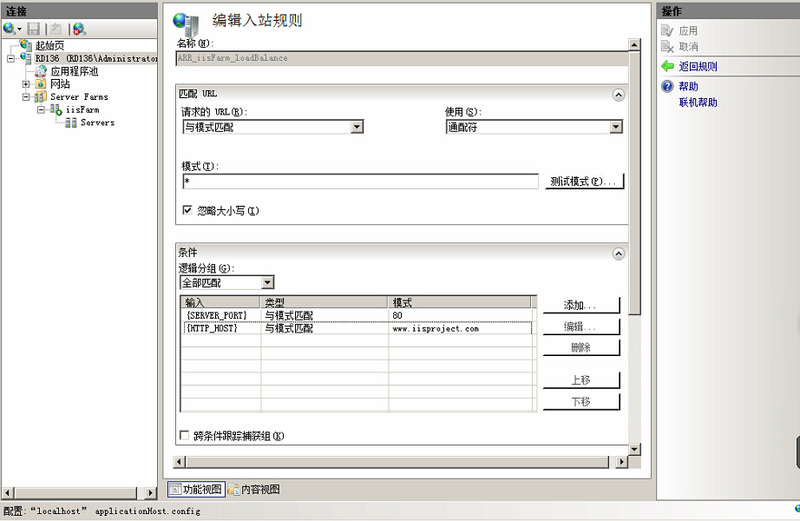 根据上图设置, 只有www.iisproject.com域名下的80端口的http请求 iis 会交给ARR中的iisFarm进行处理, iisFarm中只有localhost:8080的机器,即请求转交给了8080端口的iis应用负责处理. 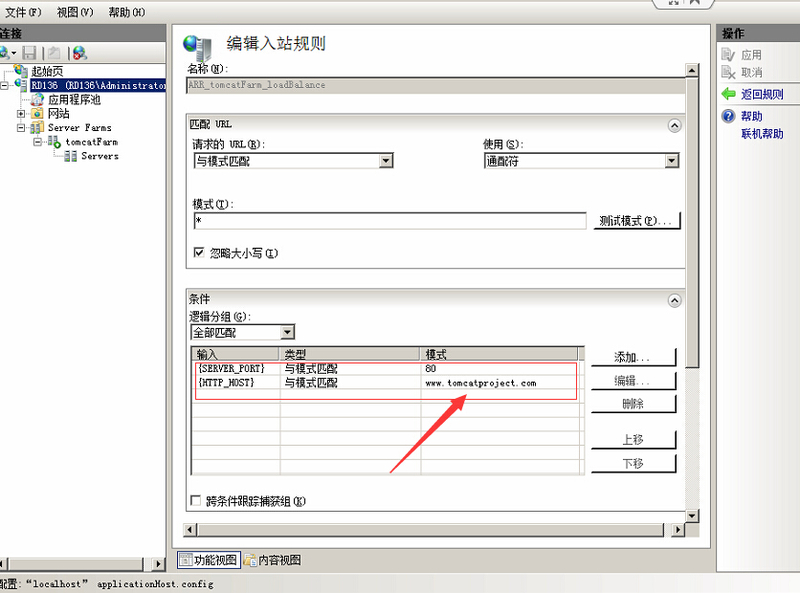 同理www.tomcatproject.com域名下的80端口的http请求 iis 会交给ARR中的tomcatFarm进行处理, tomcatFarm中只有localhost:8090的服务器, tomcat工作在8090端口, 所以请求是tomcat在处理. 场景一使用了2个不同的域名, 如果只有一个域名或没有域名, 我们也是有办法的, 就是使用 域名/二级目录 或IP/二级目录的方式实现访问, 如 www.project.com/iis,www.project.com/tomcat 或192.168.0.10/iisproject ,192.168.0.10/tomcatproject方式. 实现方式和场景一几乎一样, 只是配置routing rules时, url 为www.project.com/iis开头的交给iisFarm处理, 为www.project.com/tomcat开头的交给tomcatFarm处理, 可以通过正则表达式,通配符搞定的.